Eknath Shashti is believed to be the day when Sant Eknath Swami left for heavenly abode by voluntarily laying down his life. Eknath Shashti 2019 date is March 26. Eknath Maharaj (1533 AD to 1599 AD) is one of the most important saints among the Bhakti Saints in Maharashtra. He was also a prolific writer and social reformer. He is believed to have lived during the sixteenth century. Eknath Shashti is observed on the sixth day of the Krishna Paksha (waning phase of moon) of Phalgun month as per traditional lunar Marathi calendar. On this day, he is believed to have performed Jal Samadhi in the sacred Godavari River and left his body and merged with the Supreme Soul. 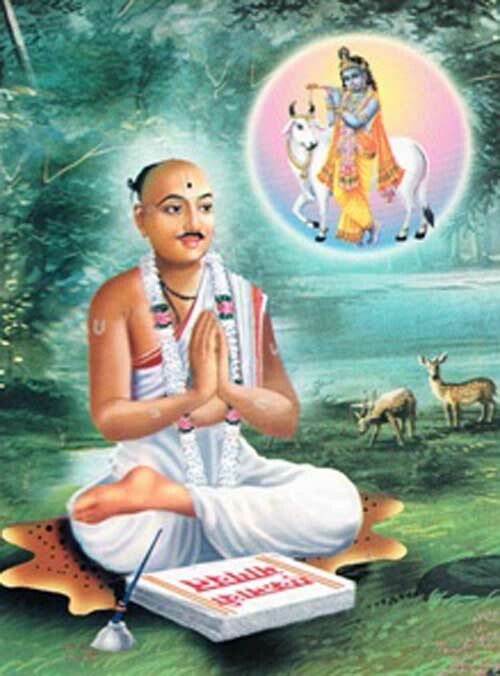 Sant Eknath is credited with bringing out the first authentic edition of Sant Dnyaneshwar’s magnum opus Jnaneswari, the famous commentary of Bhagavad Gita in Marathi. Another major work associated with Sant Eknath is a commentary in 18,800 verses on the eleventh skanda of the Srimad Bhagavata Purana known as Ekanatha Bhagavatam. Ekanath believed and taught common people that the way of Bhakti (devotion) is easier than the path of knowledge, but it was sufficient by itself to attain Moksha. As the sun requires no help to dispel darkness, so also bhakti required no external help to destroy avidya (ignorance). Eknath held that intellectual knowledge is unnecessary for God realization. Eknath illustrated this theory by the example of the milkmaids of Vraja. Those milkmaids were manifestly ignorant of any scriptural knowledge but by loving Him and even acting against the injuctions of the Shastras, they realized their spiritual goal. Eknath also held that in matters worldly as well as spiritual, the help of the Guru was not only valuable but indispensable. Eknath believed in meditation and insisted that even a single moment spent in meditating upon God could destroy tribulation, disease, obstacles, doubts, sins and egoism.